This is the most famous site for cherry blossoms in the prefecture with 1200 Prunus yedoensis trees over 80 years old lining up for app. 8km along Shiroishi River that runs in Ogawara-machi and Shibata-machi, Shibata-gun. 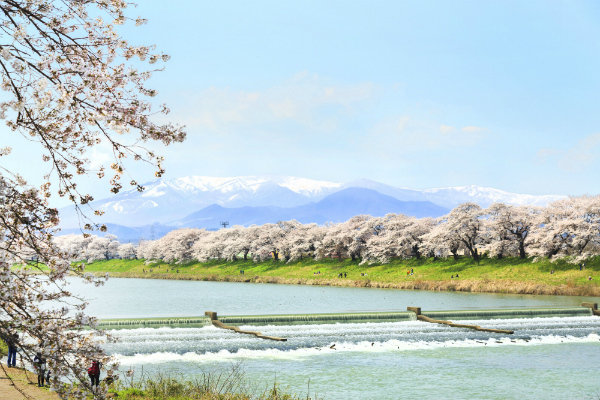 It was recognized as one of the “Japan’s Top 100 Cherry Blossom Spots” by Japan Cherry Blossom Association in 1980. You can walk under the cherry blossoms along the riverbank, and enjoy the stroll in the stunning cherry tunnel. It attracts more than three million visitors from all over Japan every year.